One of the most widely grown of all of the Australian Orchids, Dendrobium falcorostrum, in fact most likely the most popular of all and for good reasons. The flowers are fragrant, and thats a plus. Its not one of those huge growing species that are sometimes a little difficult to find a place for. 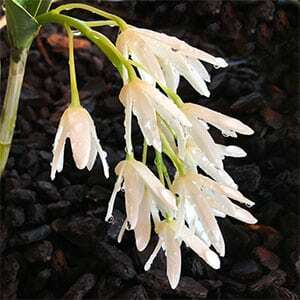 And it makes a very attractive feature plant with its brilliant white flowers. Found in the Mountain areas from Northern New South Wales into Queensland, the natural habitat is mainly one specific tree, and that is Nothofagus moorei the Antarctic Beech. However it will grow on other trees. As for fragrance, this is one of the most fragrant orchids around, on a warm day the perfume spreads through the greenhouse. Usually grown in mixture of bark and perlite, often with some scoria mixed through, the main issue with growing medium is replacing it or repotting. This needs to be done every 3 years as the bark breaks down and begins to hold to much moisture. You can also grow Dendrobium falcorostrum as a mounted specimen, and tree fern slabs are the best for this. Either way, Dendrobium falcorostrum does need to be kept moist all of the time. This is an orchid that grows well in shade, and it will flower in shade. Good filtered light is most common. By division is the most common method. Position – Shade with good filtered light.